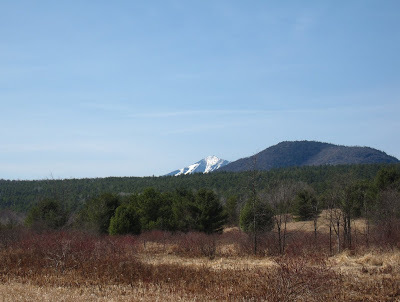 It is one of our more frustrating Spring days here in the Adirondacks; 32 degrees with rain changing to snow as I type. I wouldn't mind if there were some snow on the ground, but most of that was washed and blown away by last night's wind and rain. Whiteface is still open and the back country has some skiing up high if don't mind climbing. However, I believe I've finally accepted the fact that ski season is over for this year and I've happily made the transition to Spring bike riding. Adirondack weather is so variable that just two days ago, I enjoyed a wonderful and warm road bike ride. Therefore, I am going to remind myself of that lovely day and clue you in on a great ride. Two robins with one stone. There is a perfect ride that helps me get ready for road bike season just down the hill from the homestead, in Keene, New York. The roads are a little cleaner and flatter, and the temperatures are just enough milder to be noticed. I park in Keene and head toward AuSable Forks, NY on state route 9N. Here's the route, which follows the AuSable River. I especially like riding here in the Spring because the vernal pools are chock full of noisy amphibians like toads and Spring peepers. The early breeding toads are very active right now, so the cacophony of deep-throated croaks was loud and funny. This highway has nice wide berms for safe riding and awesome views the whole route. Another nice thing about this out and back route is that I can extend the distance as my cycling fitness level increases. Riding along the rushing AuSable River, with incredible views like today's photo of Whiteface, isn't too bad either.